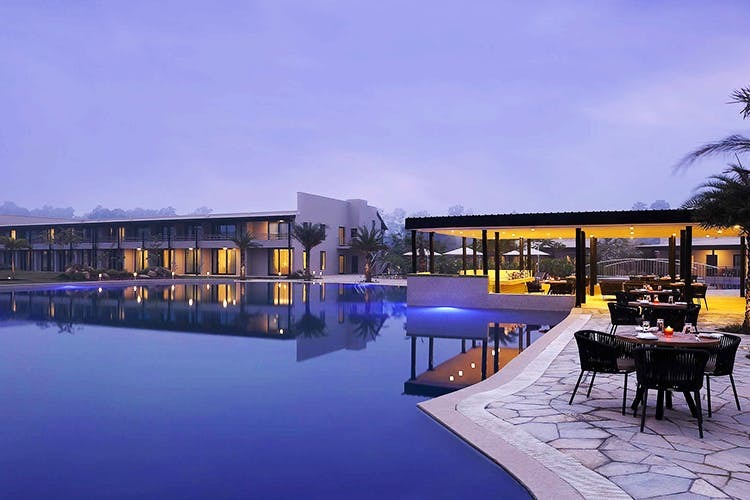 Tucked in the Himalayan foothills, Tiger Palace Resort is an unexplored gem for luxury vacationers with a state-of-the-art casino and an expansive pool, just across the Indo-Nepal border. Far away from the bustle of the city, this peaceful destination with abundant greens is a blissful retreat in itself. When on a vacation, the place where you’re staying at becomes one of the most important factors for your bookings (ah, those cushioned beds and spectacular room service—we could get used to these).When in Nepal, book this one-of-a-kind resort for exciting times. With ultra-urban facilities bound to pamper you, the resort offers luxury rooms and opulent villas with elegant designs (and scenic views). Moreover, the pool’s so inviting that you might want to take a dip even before you check in. If you’re someone for whom the sole purpose of planning a trip revolves around getting some kind of an adrenaline rush, then this resort makes for an ideal getaway for the adventure junkie in you! Hit the Casino—the largest casino in all of Nepal—and try your luck! Las Vegas might be your dream destination, but this is a fantastic practice station before you finally reach the strip. The heart beats faster with every bet placed at the slot machine, with every spin of the wheel at the roulette table, or with every card dealt out by the dealer at the game of Blackjack. With a separate VIP area above the main gaming floor (opening soon), there is space for all you seasoned high-stake players to test your luck. So, be prepared for a wild night. Whether you want to lounge by Nepal’s largest swimming pool with a sparkly drink or feast on a lavish buffet with your gang, Tiger Palace Resort offers a variety of delectable options in distinctly modern styles. Indulge your culinary taste buds at Ramro Chowk, which offers a wide range of cuisines throughout the day. For something more striking, head over to Cabana Avenue for special tandoor grilled delicacies, steaks and drinks by the water's edge. Or, give into some gastronomic delights at the Jackpot Buffet (their 24-hour restaurant at the Casino). Disconnect from the fast-paced life with the resort’s laid back charm. Covered in ample greenery and a variety of flora, it is truly a haven for nature lovers. While you’re there, pamper your senses with a soothing spa treatment, or slide into the pool for a few laps. Better still, chill out at the swim-up bar with snacks and signature cocktails for epic memories. While the resort itself is mesmerising, there are many experiences around the property to satisfy the tourist in you. Discover vibrant Buddhist culture at the UNESCO World Heritage Site Lumbini – the birthplace of Lord Buddha, just 30-minutes’ drive from the resort; or visit Chitwan National Park, another UNESCO World Heritage Site, just 2.5-hours’ drive from the resort. This marshland is a paradise for wildlife enthusiasts with one-horned rhinos, leopards and over 500 species of birds. The vacation will end, but not without a hundred Instagrammable pictures. Open your holiday calendars right away and block your dates for a fun sojourn.Book your stay here. #LBBTip Tiger Palace Resort is just 8 kms across the Indo-Nepal Sunauli border. Just take a short 2-hours flight from Delhi to Gorakhpur, Uttar Pradesh, and a 3-hour comfortable road trip covering 114 kms from Gorakhpur to Bhairahawa to reach here.